Being told you are appreciated is one of the simplest, most uplifting things you can hear. A simple 'thank you' note goes a long way. Our cards are created with love, attention to detail, and genuine desire to make our customers happy. - Count: 100 blank THANK YOU cards and 100 envelopes. - Cards size: 5 inches x 3 ½ inches folded. - Envelope size: 5 ¼ inches x 3 ¾ inches. - Two designs: 50 horizontal and 50 vertical cards. - Envelopes: 100 kraft envelopes can be easily and securely sealed with a high-quality self-seal strip. We strive for excellence, so please contact us with any complaints/suggestions/compliments or simply to say 'thank you'. 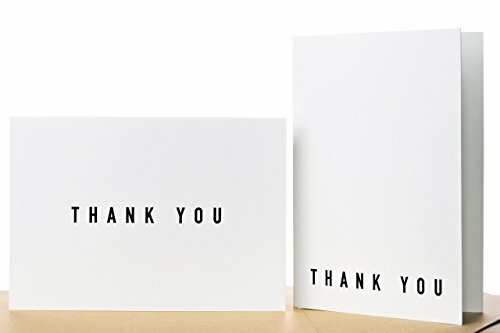 BULK THANK YOU CARDS - 100 premium quality cards will show your friends, relatives, and business partners they are highly appreciated. DESIGN - less is more! 2 simple clean designs will showcase your sophisticated style. Great for any occasion, men, women, etc. PAPER QUALITY - 300 gsm thick luxurious paper will be your love at first touch. ENVELOPES - 100 high-quality kraft self-seal envelopes will make bulk mailings a breeze. Meticulously sized cards fit perfectly in the envelopes. BOX - sturdy reusable box will let you store your unused cards. If you have any questions about this product by Verbaa, contact us by completing and submitting the form below. If you are looking for a specif part number, please include it with your message.